SAN JOSE, CA--(Marketwired - Jun 5, 2013) - Boldly going where no one has gone before, Acer and Paramount Pictures have partnered in the creation of an Aspire R7 Limited Edition notebook to celebrate the release of the film, "Star Trek Into Darkness." Acer created only 25 units of the revolutionary R7 touch-enabled Limited Edition notebook and none have been available for purchase. The companies are now offering just one of these unique products on eBay as part of an exciting auction package to benefit two worthy charitable organizations. The one and only Acer Aspire R7 "Star Trek Into Darkness" Limited Edition Package includes the revolutionary R7 touch-enabled notebook beautifully dressed with a stainless steel Star Trek logo with sand-blast finish and polished surface, along with an R7 protective sleeve with Star Trek logo. It also includes a "Star Trek Into Darkness" film poster signed by the film cast, special "Star Trek Into Darkness" content such as wallpapers and videos, Star Trek Soundtrack, a download of Star Trek: The Video Game, and unique "Star Trek Into Darkness" product packaging with a Limited Edition Certificate of Authenticity from Acer and Paramount Pictures. "Acer is giving one lucky person in the world the opportunity to become the sole owner of the Acer Aspire R7 'Star Trek Into Darkness' Limited Edition Package," said Hugues Gontier, senior director of marketing, Acer America. "We know this extremely rare Limited Edition will be a treasured prize for the winner, and it will also help two worthy charities further their missions of empowering military veterans and helping children in need." With the exclusive stainless steel Star Trek logo, this limited edition Acer Aspire R7 notebook will be the envy of all Star Trek enthusiasts. It was designed to create the best touch and type experience. It features a repositioned keyboard and a high-definition touchscreen mounted on a revolutionary "Ezel" hinge that allows it to flip, reverse, lie flat or float. The ergonomic design makes the combination of touching the screen and using the keyboard more intuitive and natural. This high-performance notebook also features a 3rd generation Intel Core i5 processor, 15.6-inch full HD (1920x1080) touch screen, large 500GB hard drive with 24GB SSD and Windows 8. 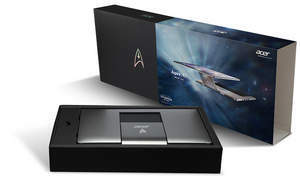 In addition to the Acer Aspire R7 Star Trek Limited Edition Package, Acer will also auction two additional "Star Trek Into Darkness" film posters signed by the cast, offering fans other unique collectibles and increasing the charitable proceeds. More information about these exclusive auction items may be found at www.ebay.com/theonlyone. Acer Offers Just One Exclusive Aspire R7 "Star Trek Into Darkness" Limited Edition Notebook to Fans Worldwide in Charity Auction. Acer Exclusive Packaging for Aspire R7 "Star Trek Into Darkness" Limited Edition Notebook.